Gurdwara Sahib Puchong, one of the larger gurdwaras located just outside Kuala Lumpur, has invited Malaysia’s health minister to a Vaisakhi programme on 13 April 2016. Dr S Subramaniam, who last came to the gurdwara four years ago, had then donated RM50,000 towards its lift. The gurdwara will commence an akhand path in conjunction with Vaisakhi on 11 April and a kirtan darbar at a separate hall on 12 April from 6.30pm to midnight. Among others, there will be a free flow of cendol, a traditional local dessert. 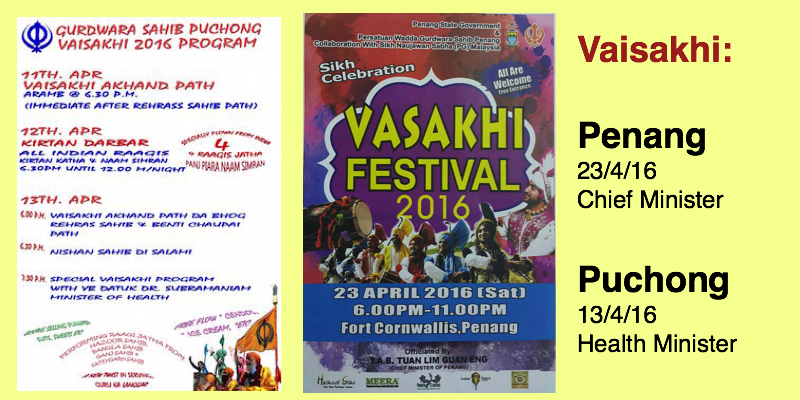 Meanwhile, Penang chief minister Lim Guan Eng will officiate a state level Vaisakhi festival on 23 April 2016 (Saturday) from 6pm to 11pm. The event is organised by the state government in collaboration with the Persatuan Wadda Gurdwara Sahib Penang and Sikh Naujawan Sabha Malaysia (Penang). Entrance to he festival is free.